No half and half pizzas. Gluten free pizza bases available for $5 per pizza. While we make every effort to avoid contamination, we make no guarantees that any of our products are completely gluten free. 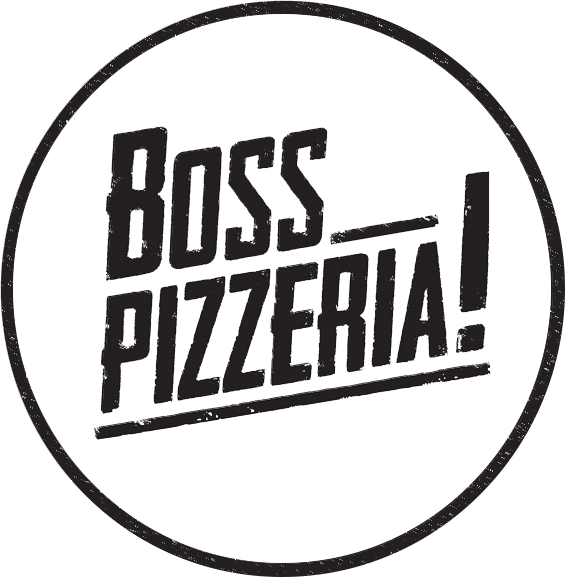 At Boss Pizzeria, we’re committed to making authentic Napoli style wood-fired pizza with a contemporary Melbourne touch. 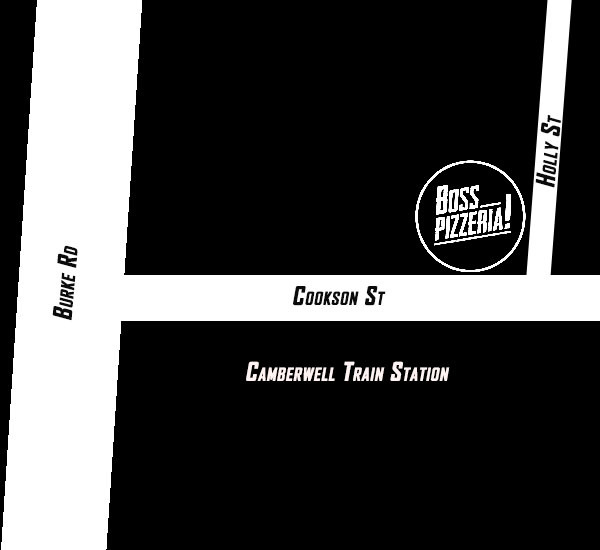 Located just across the road from Camberwell train station, Boss Pizzeria may seem tiny, but what we lack in size we make up for in flavour. We value quality ingredients above all else and everything from our starters to our desserts are made from the best local and Italian imported ingredients. We allow our dough to rise for at least 24 hours, to ensure that it’s perfectly light and airy. Then, it’s cooked in our hand-built traditional wood-fired oven at over 400 degrees Celsius. Collectively, Daniel Barrese and Johnny Logue have close to 40 years of experience in pizza making, and they have combined their wealth of knowledge to create one of the most unique and exciting pizza menus in Australia. You’ll find all the classic Italian combinations like the perfect Margherita, as well as some fresher combinations like The Boss (a Camberwell favourite – San Marzano tomato, mascarpone, parmigiano, prosciutto and rocket). Daniel Barrese (formerly of Ladro, Il Pizzaiolo, and head pizza chef at Firechief) has trained with the Associazione Verace Pizza Napoletana in Napoli, Italy. After working in a vast array of restaurants in and around Melbourne over the last 20 years, he decided it was about time to do his own thing, and took over Boss Pizzeria with his good mate Johnny Logue. Johnny Logue started making pizza almost two decades ago and has also worked at various establishments around Melbourne, including Saltimbocca, Il Forno and Da Massimo to name a few. He has spent the past few years establishing his own wood-fired pizza catering business Pizza Via (see below). These days, when not stretching dough at Boss, he's likely to be firing up his mobile wood-fired pizza oven at a birthday party, school fete or local football match. We hope to make a pizza for you soon! Pizza Via is the brainchild of Johnny Logue. It’s a mobile wood-fired pizza kitchen, which allows you to enjoy a restaurant quality pizza experience within the comfort of your own home. Pizza Via can cater for groups as small as 30 and has yet to find its upper limit. Starting with a minimum spend of $1000, we can arrange a package according to your price-point. Depending on how many varieties you need, a function will cost between $25-$40 per head. Pizza Via’s site is currently under maintenance however if you would like more information, please call Johnny on 0412 710 183. Or, just give us a call at Boss! Boss Pizzeria has limited indoor and outdoor seating. If you wish to dine in, we recommend booking - especially on weekends! Please note: bookings are not confirmed until you hear from the Boss. *Boss pizzeria will be closed over the Easter period from Good Friday 19th of April and will reopen on Friday 26th of April. Happy Easter everyone. We look forward to seeing you soon!